The two key types of analyses that are typically used with binary options trading are fundamental and technical. While some traders prefer one type over the other, it is generally best to use a combination of the two types in order to help in making a more accurate price prediction of the underlying asset. When traders use technical analyses, they engage in the studying of market prices by using various charts and graphs that track this information. Those who utilize such technical charts and graphs usually believe that most of the information that is required to make a trading determination is included within the underlying assets value. In these cases, studying the action of the underlying assets price will allow the trader to better determine its future moves. Traders may use various types of technical analyses when determining the potential price movements of an underlying asset. These analyses will allow a trader to study the historical movements of the asset in order to anticipate where the assets price will likely move in the future. Many traders look at chart patterns within technical analysis and ther are a number of these that have gained recognition universally for being highly reliably in indicating the future movement of price. The most popular of these are used by both professional and amateur traders alike and represent a high level of probability that the price will move in a certain direction given the historical propensity for this to occur. Why do charting patterns work? Firstly they represent a visual reflection of the supply and demand in any given market. This affects price and forces it to move around in a certain way on a price chart and form a pattern to which traders apply a memorable name. Chart patterns such as ‘double tops’ and ‘double bottoms’, for example, are actually a reflection of market weakness and therefore signal a potential reversal or correction in price. The fact that price tries to push lower or higher twice, and eventually fails, results in a reversal. The second reason why price charting is effective is becasuse it is something of a self-fulfilling prophecy. As the most popular chart patterns are known by almost all traders who largely look to trade these in the same way, it results in price moving in the desired direction. Although this is looked on sceptically by some, chartists argue that the pattern showing an imbalance in supply and demand has to initially form in order for traders to trade based on this. 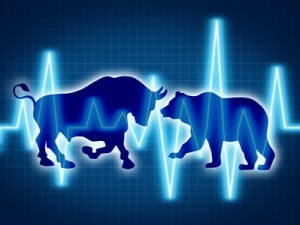 Therefore, traders are simply reacting correctly to what the charts are telling them to do. Whatever the reason for charting techniques being so effective, it is obvious that it can be a highly profitable way to trade binary options. There are several variations that are used in technical analysis. These can include momentum studies, trend following, and mean reversion analysis. Momentum Studies – Momentum studies, which is also referred to as Moving Average Convergence or Divergence (MACD), is a measure of the market’s momentum. This type of analysis will help a trader in determining whether a particular assets momentum is falling or rising. Momentum studies can measure and compare daily moving averages with longer-term moving averages – and if the changes that occur within short-term averages are greater than those that occur with longer-term movement, then the analysis will show that the momentum of the underlying asset is likely on the increase. Trend Following – Trend following is the analysis of an underlying assets historical prices and its moving averages in order to help in determining if the asset is or is not following a particular trend. In most cases, moving averages are determined by dropping the days that are the farthest away out of the overall calculation. As an example, if a trader is studying an underlying asset’s 7-day moving average, then the information from the 8th day will be dropped. It is typically possible to define whether or not an asset is following a trend if and when its shorter-term moving averages move above or below its longer-term averages. Mean Reversion – Traders who use mean reversion in their technical analysis will base their price movement assumption as if the asset will return to its mean – or its average – after a certain amount of time moving away from it. In many instances, traders will use mean reversion analysis when they are analyzing two similar assets. By studying the past movements of underlying assets, traders can have success in determining the future price of such assets. And, while there are many traders who prefer to use fundamental analyses – the study of an asset’s potential supply and demand based on economic and market conditions – those who consistently make use of technical analyses will oftentimes have great success.